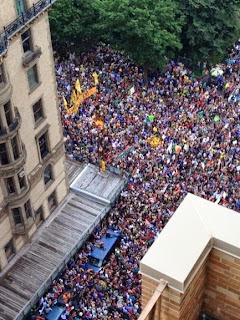 People's Climate March: so big, there was no end to it. As my CelloPlayer was working on the sign that I was going to carry at the Climate March, we talked about how many people were expected to walk the March. 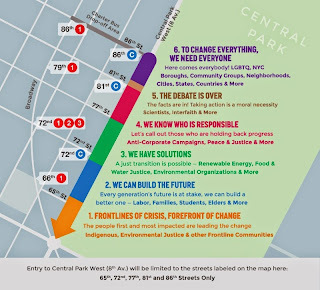 Being a geek, and never one to pass up a teaching moment, I pulled up a map of Central Park West where marchers were to collect. We set out to answer the question: if the organisers are expecting 100,000 people to show up for the march, would they fit in the space provided for the lineup? We measured out the space between Columbus Circle (59th Street) and 86th Street - a little bit over 2km - and estimated the width of the street to be about 15 meters: So the total area to stand on was 30,000 square meters. Give or take a few thousand. The math is straightforward: if you want to fit 100,000 people on that area, you need three people to stand on each square meter. When we joined the march, a little before 11am, Central Park West was already pretty full. There were barricades separating the road from the sidewalk, making the collection area a little narrower than I had estimated, but not by much. As time went on, and more people joined the lineup, the crowd got denser. Everybody was talking to everybody, which makes you stand closer to each other anyway, but then you look up and suddenly realise that yes, now we are standing with more than three people to a square meter. And still the crowd was getting denser. People remarked they were starting to feel claustrophobic. The head of the march was to leave at 59th Street around 11.30am. So we waited for the movement to reach 72nd Street, where we were standing. And waited. People were breaking out their lunch boxes, offering goodies to their neighbours, and generally being an incredibly patient and good-natured crowd. There was word that the lineup was now stretching out to 89th Street. A lone conspiracist suggested that "they" were holding up the start of the march, but couldn't offer any credible reasons. I countered with the positive alternative: that so many people showed up, they had to line up in the side streets. Who could tell? we were in the crowd, and couldn't see anything. There was a helicopter circling overhead but if they were taking images, nobody had enough bandwidth to download them. But after the march, I came across this photo, reproduced here courtesy of the photographer Noah Friedman-Rudovsky. It shows how dense the crowd was. And how it was overflowing into 72nd Street. (I was standing right behind the yellow banner). In the end, we didn't start moving until well over two hours after the official 11.30am starting time. The dense crowd started to shuffle forward, then to walk as we got more space, moving to the side as yet more people joined the march from more side streets. We didn't really get into a stride until we rounded Columbus Circle and started walking along the south side of Central Park, to reach 6th Avenue. We stopped at an eatery for a very late lunch, and to rest our arms, unaccustomed to holding up a sign for hours. That's when we got the message that marchers were to disperse once we reached 42nd Street and 11th Avenue. This was stunning: An enormous event had been planned at 11th Avenue between 34th amd 38th Streets: speeches, a ribbon tying ceremony, food, networking. All of that had been let go because it became clear that there was absolutely no way we could have fit in the space provided. So there was no end to New York's Climate March. Which is fitting in a way, because the Climate March is really only the beginning of a lot of work we need to do, to turn our ship around, away from fossil fuels and toward a cleaner future. When the final numbers came in, the tally stood at 400,000 marchers. Or four times more than expected. I'd say that's a statement. Because for every marcher, there were many who wanted to join the march, but couldn't. This really is what it was hoped to be: too big to ignore. If you didn't make it to any of the marches, you can add your voice to the many that are calling on world leaders to take bold action on climate that will make a real difference. 350.org is collecting your signature here. 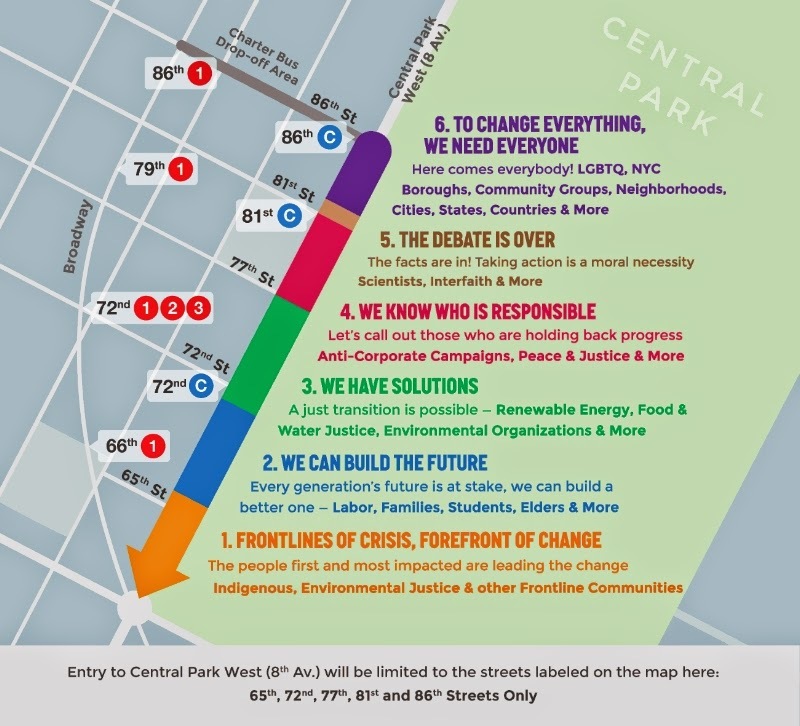 How will you travel to the Climate March?